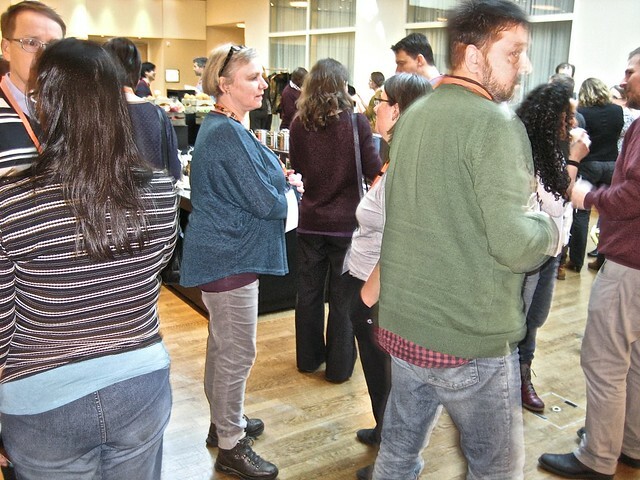 Iris, Cerys, and Colin attended – and very much enjoyed – the IDCC16 Conference in Amsterdam, 22-25 February 2016. Our presentation, “Using metadata actively”, began by explaining that making metadata mean more was our aim, expressed in just four words. A PDF of the talk is available for download from the Conference programme. Judging by the questions from the audience, we struck some chords. 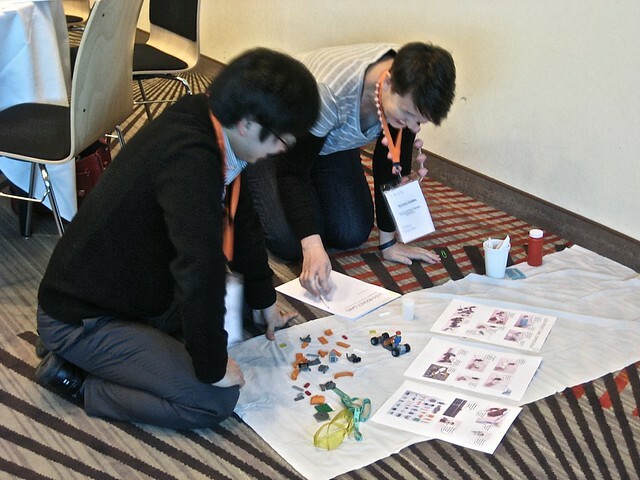 Our workshop, “Metadata in Action”, was enjoyed by all the participants. See Metadata in Action workshop for a fuller description of this workshop. 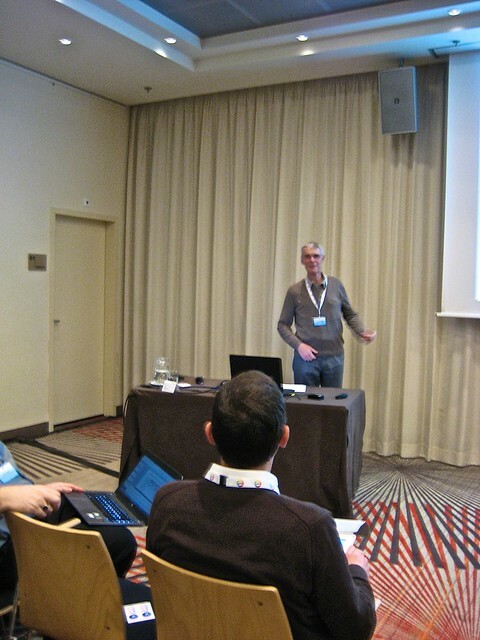 On 25th February members of the CREAM team held a workshop “Metadata in Action” at IDCC 2016 in Amsterdam. The workshop lasted 3 hours and was designed to give participants an indication of the potential impact of using metadata actively on enhancing research. Specifically, they were engaged in discussions and fun hands-on activities, using both sound art and science, to explore the nature, generation, capture, curation and active use of metadata for research. After a brief introduction of the CREAM objectives, Iris Garrelfs lead the group in sound art activities. 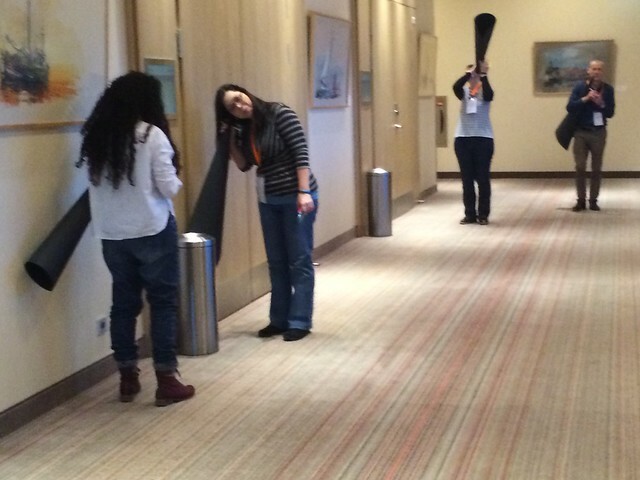 such as a listening walk uncovering “planted” sounds or exploring the environment with a “listening cone”, that led participants to recognise how early inherent concepts impact on even very basic experiences such as listening. Potentially recording such “inward” observations and decisions taken as a result might lead to increased transparency and facilitate the later identification of errors or where new routes could be taken along a previous workflow. Cerys Willoughby facilitated the second half of the workshop, getting the participants think about metadata within scientific processes. The activity involved completing a scientific experiment using a chemical reaction in the form of Alka-Seltzer and water to power a small Lego car of their own design. The participants were encouraged to design their own experiment and to record their results on one of three randomly allocated templates. As well as discussing what the active metadata in the experiment might be, the participants shared their experiences of recording their process, ideas and decisions. We set out to encourage our participants to think about metadata in a different way and to have some fun. The discussions at the end of the workshop suggest that we accomplished both aims. Not only did the participants enjoy the workshop, but they also gained an insight into their own approaches to situations, the importance of knowing their biases, and capturing decisions to provide context for their work. Colin also presented our paper at the conference. You can find out more about the presentation and how to get the paper from CREAM at IDCC16. We all agreed that it had been a very productive and positive meeting. We’re looking forward to hearing from Jisc about the project selection. If the outcome is favourable to us, we’re confident that we know what we have to do and how we’ll go about achieving our goals. In the meantime, with the IDCC16 Conference in Amsterdam coming up next month, we’re busy finalising our paper, “Using metadata actively”, and preparing for our workshop, “Metadata in Action”. We are already looking forward to February next year when we’ll be taking part in IDCC16 in Amsterdam. We will be presenting a paper based on our findings for the project to date – titled ‘Using Metadata Actively’. We will also be running a half day workshop during the conference to promote our work and to engage with others with similar interests across a variety of disciplines. The workshop will be a mixture of fun activities and discussion to explore the active use of metadata in art and science. You can find out more about the workshop here. As Phase 2 of the Research Data Spring initiative nears its end, we are well into our preparations for Sandpit 3. A teleconference on Friday 27th produced team agreement about the three main deliverables that we will propose for Phase 3, with an outline of what the three associated work packages should comprise. We have also prepared our responses to the six questions that Jisc have posed, so the time between now and the meeting in Warwick on 10th and 11th December will be devoted to the finishing touches. We are looking forward to the Sandpit. All arrangements are well in hand for our next team meeting, which will be in the Card Room at Chelsea College, University of the Arts London. The agenda is available from the ‘Our meetings’ menu on the website. We are looking forward to Daniela joining us for this meeting. 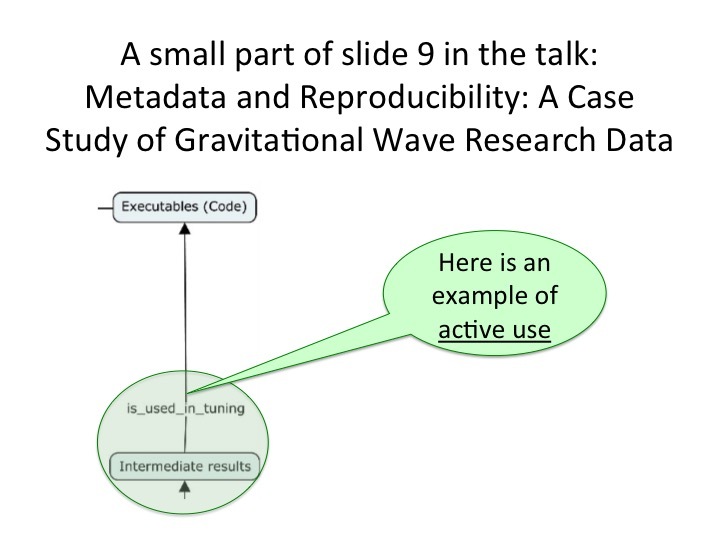 Our long-term goal is to create guidelines and exemplars to demonstrate how the active use of metadata can make research more effective, agile and timely for researchers. For Phase 2 we undertook to produce a “structural outline” to show what the guidelines would consist of and which topics we would cover, so we are assembling the material for that deliverable in a framework document. Our work to date suggest that two prominent considerations will be: (a) the importance of visual representations; and (b) emphasising the decision points and the underlying motivations. The document will also cover potentially relevant standards and specifications. During the six months since the project began, our understanding of its scope has developed considerably. We have recognised more areas of commonality between the arts and sciences that we had anticipated and have gained a great deal from the collaborative activities between partners. We have explored several applications in greater detail: Neutron source experiments at the STFC ISIS facility; Procedural Blending in Sound Arts; GeosMeta at Edinburgh; and Digital recording of chemistry experiments. 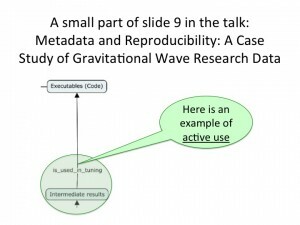 We believe that Annalist has been useful for experimenting with and modelling existing metadata, but unless it is also being used for actual data collection processes, we now think we will probably need to complement Annalist with tools for active metadata capture that are closely coupled with tools used for the actual research or creative process concerned. Notwithstanding that point of view, the CREAM work has usefully informed the ongoing development of Annalist, both through direct involvement with creating the exemplar data, and also by helpful reviews and comments from project partners who have been using it. Although we said that we would report on active metadata use in other disciplines, we have recognised that producing such an assessment is a longer-term aim, so we are now undertaking preliminary investigations and planning how we might identify examples. We have made useful contacts and generated interest in our project at the TaPP workshop, the RDA conference, and through personal communications. We hope to make a strong impact at the IDCC16 conference in February 2016, to which we have submitted two practice papers and a workshop proposal. Our next team meeting will be on Friday 13th November. When the agenda has been agreed it will be available on this website. Since our team meeting on 21st September, we have been using an Action List to keep track of our ongoing activities. Currently, with one minor exception, every item has either been completed or is a work in progress. We are also endeavouring to keep our Project Plan up to date. We have our second milestone at the end of this month, for which we intend to post the current status of our work towards all of our Phase 2 deliverables.